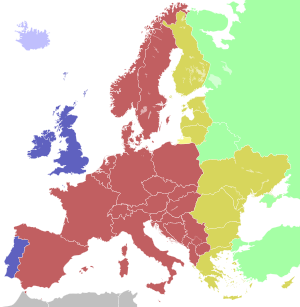 Until 2016, Turkey was using Eastern European Time (EET) in the winter (UTC+02:00) and Eastern European Summer Time (EEST) (UTC+03:00) during the summer. The date for transition between standard time and daylight saving time generally followed EU rules, but had variations in some years. In 2016, the decision to stay on UTC+03:00 year-round was enacted. 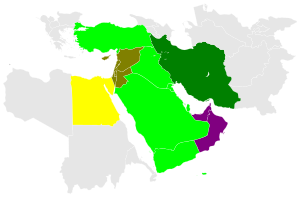 In October 2017, the Turkish government announced that starting October 28, 2018, the country would revert to EET, but this decision was reversed in November 2017. In October 2018, a Presidential decree announced that UTC+03:00 would remain the year-round permanent time zone for the country. The western half of Turkey should be on EET (UTC+02:00) while the eastern half should be on TRT (UTC+03:00). Cities in Turkey such as Istanbul and Ankara are located west of 37°30′E, so idealy they should be using EET (UTC+02:00). ^ "Time Zones - Istanbul". timeanddate.com. Retrieved September 11, 2016. ^ "Time and Date - Istanbul, Turkey". ^ "Saatler geri alınıyor!". Yeni Düzen. Retrieved 18 October 2017. ^ "Time Zones - Istanbul". timeanddate.com. Retrieved August 3, 2016. ^ "Türkiye'de saatler ne zaman ileri alınacak?". www.haberturk.com (in Turkish). Retrieved 2018-03-28. ^ "Yaz saati uygulaması sürekli hale geldi". www.hurriyet.com.tr (in Turkish). Retrieved 2018-06-12. ^ "Resmi Gazete'de yayımlandı: Flaş yaz saati kararı". Hürriyet (in Turkish). 2018-10-02. Archived from the original on 2018-10-02. Retrieved 2018-10-02. This Turkey-related article is a stub. You can help Wikipedia by expanding it. This page was last edited on 19 April 2019, at 02:47 (UTC).